When 2D Code is not available, get Client information by entering name and birthdate. Ability to print, download, email and fax any document to clinicians who need this information so they can provide you the treatment that you want. Videos that recorded you stating what treatment you wanted and explaining why—may convince everyone what treatment you really wanted—and thus eliminate potential conflicts. Suppose one of your wishes is to refuse attempts at Cardio–Pulmonary Resuscitation. Emergency medical personnel in most states are trained to honor three instruments. One is a piece of paper called the official pre–hospital DNR or out–of–hospital order DNR. The second is a Physician Orders for Life–Sustaining Treatment. Both you (or your surrogate decision–maker) and your physician must sign one of these forms. Problem: this piece of paper may be hard to locate quickly in emergencies. The third instrument is a medallion (or bracelet) that you wear all the time. Problem: bracelets are too small to provide much information beyond “DNR.”Larger medallions can be engraved with a few additional orders, but they cannot play videos or display documents. The MyLastWishes.org Program offers solutions in a total of six areas. In addition to the DNR order, you may have other urgent wishes to direct first emergency medical personnel responders and physicians; for example, “Do NOT start an I.V.” (intravenous hydration). You may want a timely, peaceful transition. Extra fluid could prolong the process of dying and increase the risk of more pain and suffering. Paramedics are trained to start I.V.’s almost “automatically” so unless they see this order, they could inadvertently sabotage your goal. You might have a chronic life–threatening illness and want to increase your chance of survival. (Natural Dying is something you don’t want for many years.) The MyLastWishes.org Program is designed to quickly inform emergency medical personnel and physicians about your medical diagnoses and medications so they can, for example, figure out what the most likely causes may be—if you suddenly lose consciousness. Middle Stage Dementia patients risk wandering and getting lost. This could cause harm, and be life–threatening. People who find the lost patient must quickly learn the patient’s identity, the family members’ address and contact information, and the physician’s contact information. MyLastWishes.org’s provides this information and a map with directions from present position to the caregiver’s home. Suppose the time comes for your Natural Dying but there is a conflict. Your proxy/agent can play your previously recorded video on which you expressed WHAT you want and explained WHY, and the video of the health care professional who interviewed you and gave the opinion that you had the mental capacity to give your informed consent for Natural Dying. These videos can help convince others to HONOR your wishes promptly, without conflict. For your continuing care after an emergency, your future physicians can retrieve all your Advance Directive forms and your signed informed consent forms. For example, they can retrieve your consent for Palliative Sedation to Unconsciousness—if no less aggressive treatment can relieve your unbearable pain and suffering. Others may need access to your financial papers and your signed financial power of attorney. The latter may be the kind of document that you decide to label as “Private,” when you submit it for storing, to Caring Advocates. You may also want to include in your “private” papers, your “Ethical Will,” where you describe the VALUES that were important for you to live by, and that you want to recommend others to follow. The TWO Challenges: The chances are about two-out-of-three, that someday, you will suffer from a disease or injury, that will leave you incapable of saying what medical treatment you DO or do NOT want—just when your future clinicians must make decisions that can determine HOW–LONG and HOW–MUCH you will suffer before you die. The First Challenge is your future clinicians will need a rapid way to retrieve information to learn WHAT your wishes are. This technical challenge is actually the easier of the TWO and some sort of solution has been available since 1999. Caring Advocates now uses the latest and most widely available “smart” cell phone technology. The Second Challenge reminds me of an old saying: “You can lead a horse to water, but you can't make him drink.” The practical question is: What can you do, in advance, to convince your future clinicians who are NOT likely to know you, WHY they should HONOR your wishes? As you will see, the MyLastWishes.org Program that Caring Advocates offers is unique. The second Challenge reminds me of an old saying: “You can lead a horse to water, but you can't make him drink.” The practically question is: What can you do, in advance, to convince your future clinicians who are NOT likely to know you, WHY they should HONOR your wishes? As you will see, the MyLastWishes.org Program that Caring Advocates offers is unique. To attain your goal: Suppose your goal is ambitious; that you want to maximize pleasure and minimize pain for the last chapter of your life, just as for any other chapter. As you seek a timely and peaceful transition, you will not lead your future clinicians to a trough of water, but to one of the most controversial areas of medical ethics. You will enter an area where clinicians can, and sometimes will, refuse to honor your wishes. 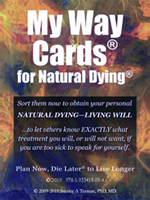 The MyLastWishes.org Program is the last of the set of “ironclad strategies.” You set this up AFTER you have made decisions about your treatment preferences (by sorting My Way Cards that generated your Natural Dying—Living Will) and after you discussed your options with your physician and signed other forms to give your informed consent. For example, you may want Natural Dying and Palliative Sedation, someday. Enduring days to weeks of unending, unbearable pain and suffering before you die. All strategic forms are designed to overcome potential challenges so your future clinicians WILL HONOR your wishes. Adding the MyLastWishes.org Program can give you the confidence you need to avoid adding the tragedy of premature dying to other tragedies associated with dying. Knowing you can die when you WANT relieves you of the need to die when you CAN, so you can “maximize pleasure” for the last chapter of your life. The book, Peaceful Transitions: Plan Now, Die Later—Ironclad Strategy provides specific details and is available in several formats. ©2011 - 2019 Stanley A Terman.